My youngest son Noah is turning one soon, and I’ve been in party planning mode for months! I’ve mailed the invitations and have taken care of the bigger details of the food, prepping the house, etc. Now I’m concentrating on the fun stuff – decorations and other accessories that I think really pull a party together. This year I’m fortunate to have a little help from Doc Milo in that department. 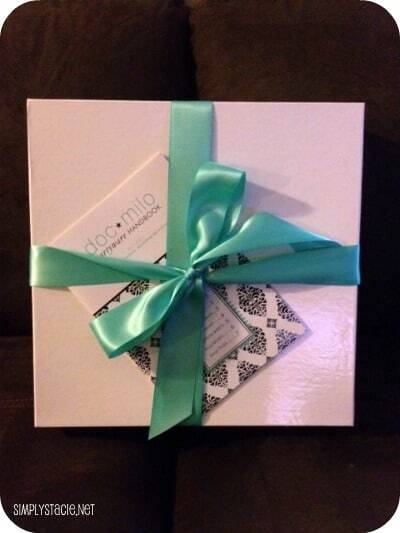 Doc Milo was started in 1998 by Sarah Sheffer. 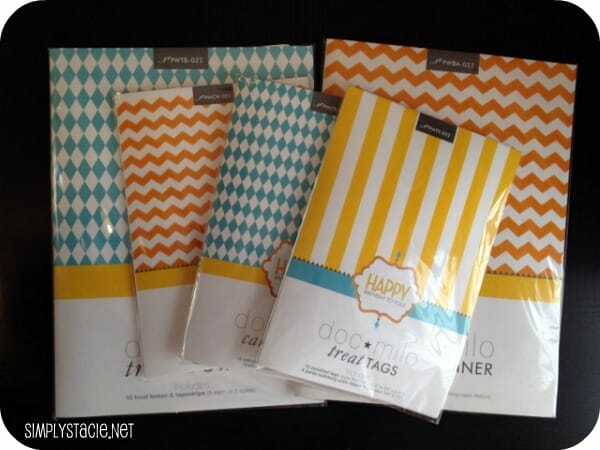 Having started out as simply a small line of greeting cards, Doc Milo has now grown into a full-line party paper supplier, with fun designs and quality products for every occasion. New for 2012 is their line of coordinating partyware – with themes for birthdays for adults and kids, bridal and baby showers. I was sent a “Classic Carnival” yellow and blue first birthday collection for Noah’s upcoming bash. 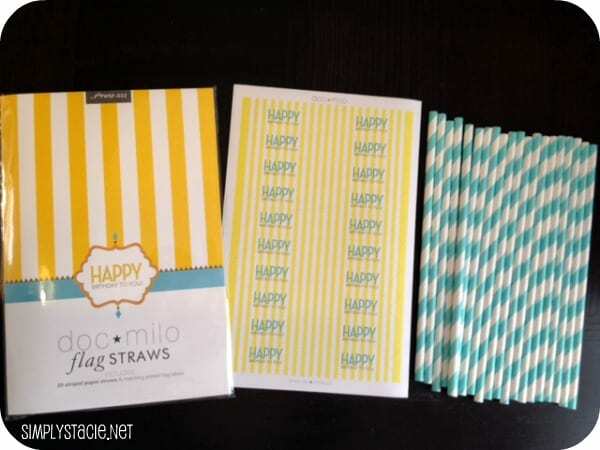 The collection I received contained coordinating cupcake wraps, flag straws, treat boxes, treat tags, pattern sheets, cakepop kits and a party banner. The package that arrived was wrapped as if it was a present – and that impressed me before I even opened the box! Under the ribbon on the box was a Doc Milo Partyware Handbook – filled with instructions on how to assemble the items, as well as suggested uses for the pattern sheets that were included. The quality of paper they use is fantastic – very sturdy, and shows off the colors really well. I’ve pre-made each item in the birthday collection (I like to stay ahead of the game!) and found each and every component of the collection very easy to assemble. 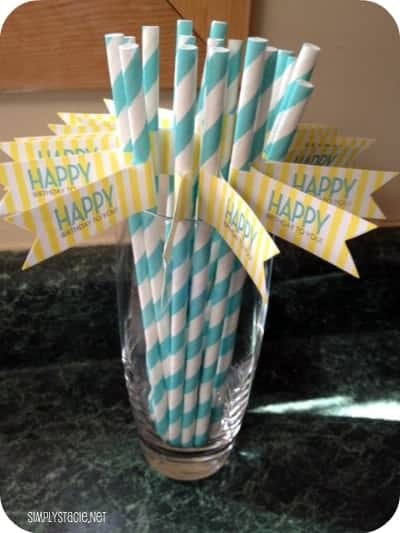 I’m excited to put out the little treat boxes, which are the perfect size for a few candy treats, or popcorn and I’m sure the adults and kids alike will get a kick out of the straw flags. Cupcakes are a must at all my parties, and the collection’s cupcake wrappers are a great way to make a simple treat something fancy. 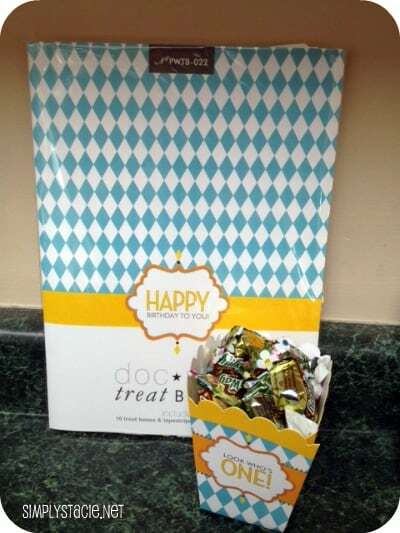 The treat tags will be perfect to identify the yummy food at the buffet table. 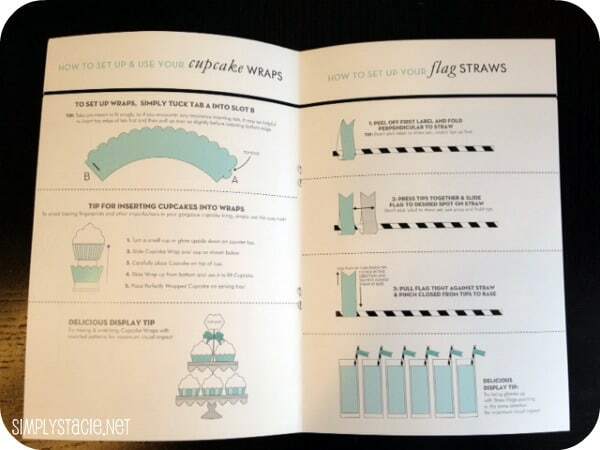 The collection also includes cakepop kits – which I’m actually thinking of using with mini donuts – and matching pattern sheets, some of which I’ll use to line the cupcake stand I’ll be using. And the coordinating party banner that I’ll drape along the buffet table is perfect to tie the whole theme together. Each item in the collection can be bought separately and range from $7.50 – $15 at various online retailers. I like the Connor’s Cupcake birthday invitation. PWBA 004 | party banner. I really like the bridal shower party ware. The colors are fantastic. I like the PWCK 022 | cakepop kit. The PS 015 pattern sheets look very nice! Hi, I do enter contests some and saw a Deanna B. on the winners list. I doubt it is me but just in case I thought I should check. It was Doc Milo #284. Please let me know if possible.